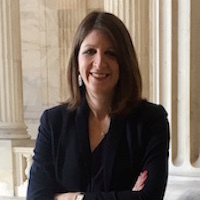 Elizabeth Herman is an executive director on the federal government relations team of JPMorgan Chase & Co. She joined JPMorgan Chase after serving for six years as legislative counsel to Senator Claire McCaskill. During her time on Capitol Hill, Elizabeth specialized in tax and financial policy and was the Senator’s lead staffer for issues before the Senate Finance Committee, Permanent Subcommittee on Investigations and the Special Committee on Aging. Elizabeth is a tax lawyer by trade, previously working for a senior member of the House Ways & Means Committee and as an associate in the derivatives / tax division of Thacher Proffitt & Wood LLP. She holds a master’s degree in tax from NYU School of Law, a law degree from the University of Wisconsin Law School, and an undergraduate degree from Cornell University.